I very much enjoyed the class and think this is something I'd like to do more of. I also think I learnt enough to get started on my own, provided I don't leave it too long before trying again. Once I've got started, I suspect I could make a lot of progress with just practice, though there's probably a lot I could learn from other people, too. At about the same time, a dear friend of mine offered to lend me her spinning wheel, as she hadn't used it for some time. As it happened, the next time we met was at her son's wedding, and she kindly brought the wheel with her to the wedding and handed it over to me there. Chatting to her daughter Polly on the same occasion, I lightheartedly promised that I'd wear something handspun to her wedding, at some unspecified time in the future. Once home, I found the wheel a little daunting. 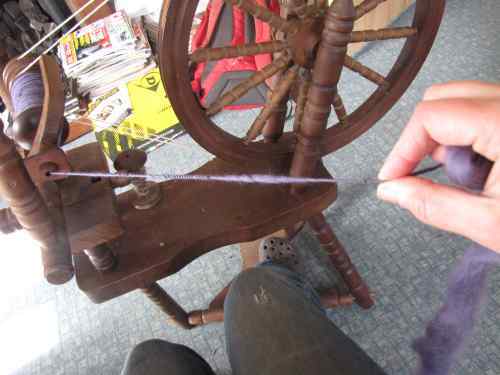 I looked at it nervously from time to time, noting its lack of drive belt or connection between treadle and wheel, and the bits of half-spun wool tangled around the wheel's axle. I picked at these occasionally until eventually the wheel ran freely, but didn't get much further, and the wheel gradually retreated to an out out of the way corner. 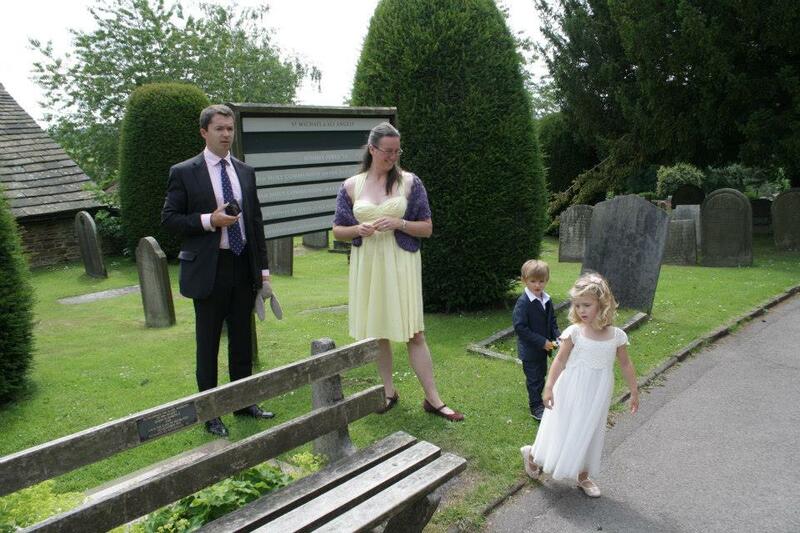 Just over a week ago, Polly got married. Some weeks before that, I started thinking about my promise to wear something hand spun. I was quite sure she'd have forgotten about it and even if she remembered, was hardly likely to care. All the same, it was a reminder of just how long I'd neglected the wheel and it was a shame to leave it unused, especially considering the effort taken to get it to me. In the meantime, I had got as far as buying some carded wool, with the best of intentions to use it. I had a little bit of cheap brown wool to practise with, and some gorgeous purple merino to make something nice. As at the class, if I started with beautiful purple fluff, surely whatever I made would end up looking nice? Do check out Spinwise.co.uk, where I pinched the photo from. They have many nice things. Having found a similar wheel online, I could see that it differed from the one I learnt on in a key feature: Instead of having a break (an element I found to be of utmost importance to my spinning attempts), it is a double drive wheel. This means that the drive belt goes around the wheel twice, once to drive the flyer and once to drive the bobbin. The drive wheel on the bobbin is smaller than the one on the flyer, meaning that the bobbin turns faster, and the difference between the two is what gets the yarn wound onto the bobbin. There are two things going on here: First the yarn is twisted, then it is wound onto the bobbin. All very clever, but the fixed ratio made it feel like I had less control than with the brake. It seemed that string was an acceptable material for a drive belt, so I made a belt from string. First though, I had to find out how to adjust the tension. This involved twisting knobs that didn't want to be twisted - most nerve-racking on someone else's wheel. String? What string? I have no idea what you're talking about. 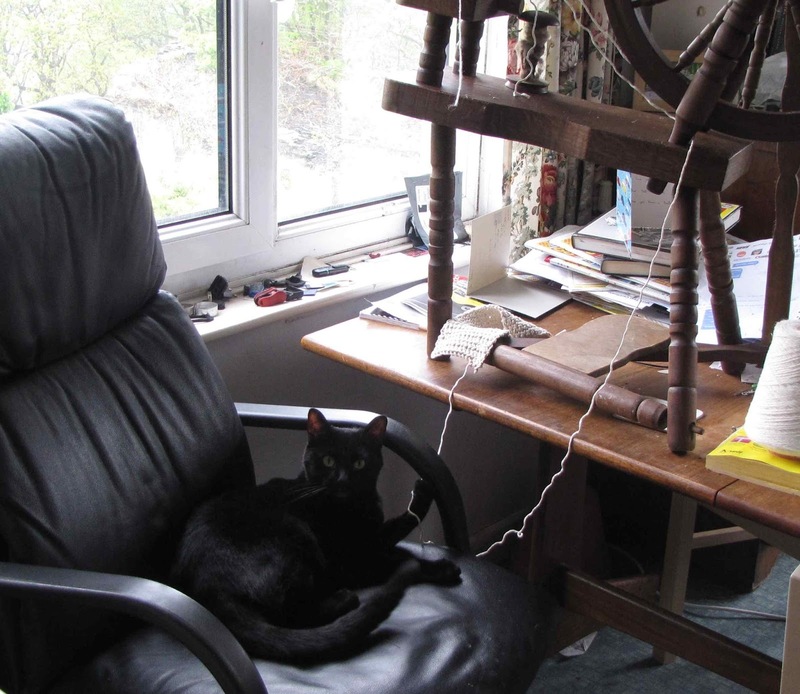 Once I had the wheel working, with a little help from George, I had a go at spinning my cheap brown wool. It wasn't easy. To start with, I couldn't get it to wind onto the bobbin at all. I spent ages adjusting the tension until it occurred to me that maybe I wasn't spinning the yearn fine enough to go through the orifice, and it was just getting stuck. As well as working on my spinning technique, I did quite a bit of polishing of various parts of the wheel, and eventually got going. By the time I got to the end of the 50g of brown, I was feeling reasonably confident that I could make a useable yarn. It was still very thick - so much so that I decided not to ply it (twist two together) but use the singles directly, as I didn't want super-chunky yarn (nor was I entirely sure the bobbin would take it). I crocheted up the brown practice yarn, both to check that it was actually possible to crochet single ply, and see what size piece I'd end up with following the pattern I had in mind. I say, follow and pattern as if it was all written down. It was just an idea. Crocheting it up gave me a chance to see whether it was a good idea or not. After reasonable success with my test piece, I started work with the purple fluff. George like this very much. 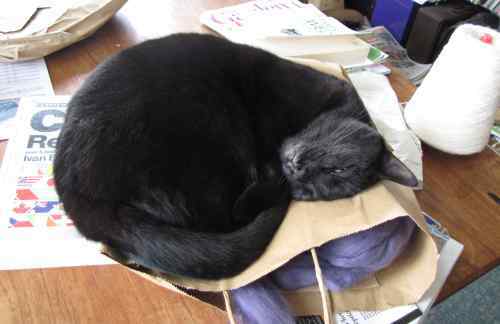 I managed to persuade him not to get into the bag of fluff, but he kept getting as close to it as he could. George liked the purple fluff. ... but I'd seen beginners' guides offering the advice that first attempts usually end up being fancy yarns like this, so I didn't feel too bad about it. Also, I discovered that it's possible to improve it after the event with careful twisting and drawing out, though there was a risk of breaking it every time I did this. I crocheted the yarn straight off the bobbin, without bothering to wind it into a ball in between. This meant I was alternating spinning with crocheting, which I quite enjoyed. Since I was using singles, I could join one bobbin-full to the next in exactly the same way as I'd join yarn when spinning, so I have a piece crocheted from a single strand of yarn, which is quite pleasing. The second time I did this, I failed to take the bobbin off the spinning wheel before joining, leaving me with a bobbin-full of yarn on one side of a small hole, and a half-crocheted scarf on the other. 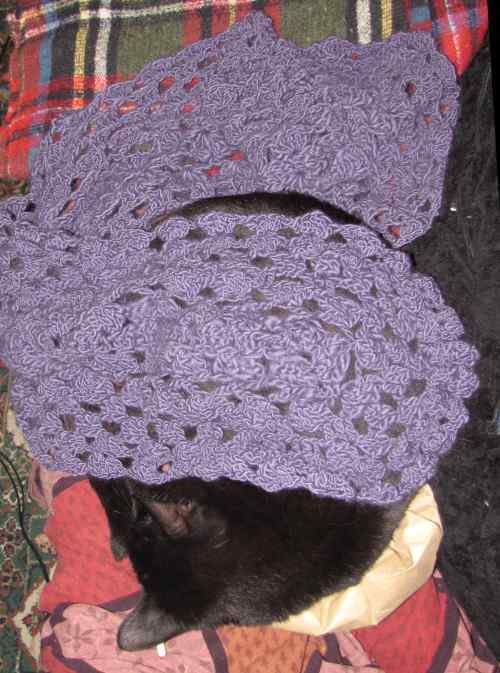 The crochet work was somewhat less portable than it might be until I'd finished that bobbin. It's a little too short to be a scarf, and a little too narrow to be a shawl, but at something between the two, it's quite wearable, and I did indeed wear it to Polly's wedding. The next step is to start from a raw fleece and learn how to scour and card it. This may require the purchase of equipment. I had a similar adventure - I bought a second hand wheel that needed various tweaks before I could start and once I'd started. I spent a lot of time not knowing whether I was to blame for difficulties or the wheel, and I almost lost patience with it, but I'd glad I stuck to it. It's such a relaxing, pleasurable activity. I can spin pretty evenly now but my problem is that I always spin too finely, which even plyed is hard to crochet (it's why I started weaving). I hope to conquer even, consistent singles one day! Processing a raw fleece is on my to-do list too. A bigger to-do is to grow, process and spin my own flax/linen -- one day, one day! It's hard to imagine that spinning too finely and too evenly could be my biggest problems. When I reach that point, I'll come back here and eat my words. Yes, I have dreams of plant-based yarn, too. I'm eyeing up nettle. It may not be the easiest stuff to process, but it sure is easy to grow! I've never tried spinning on a wheel- I wanted to try spinning and bought a drop spindle. I've spun some wool that I bought ready processed, but I also bought a completely unprocessed Jacob fleece. I washed it a bit to discourage moths, but generally I just grab a bit and spin it, without combing it etc. 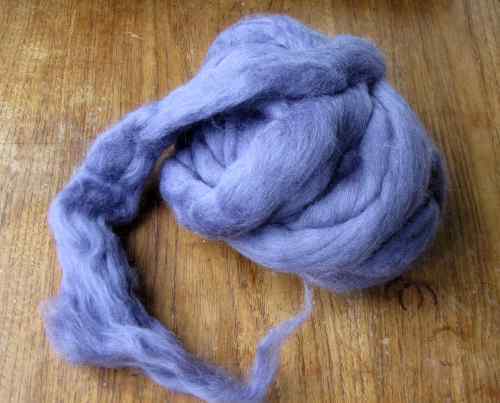 I find I prefer spinning wool that is a bit greasy to the processed stuff. Not actually spun enough to knit anything from it, however, so there might be a huge flaw in my disregard for the 'rules' of processing fleece that I have not yet discovered...possibly that any garment will make me smell like a sheep..
That's interesting about spinning unprocessed fleece. That could save a lot of work (as well as expense) if the result is OK. Presumably you could wash it when it's all knitted up, I guess. If it felted a bit, that would matter much less once it was in the shape you wanted it (unless it shrank really badly, of course). I do have a couple of fairly clean fleeces that a friend gave me. I haven't even tried taking bits out of the bags, yet, but I was warned that wool is in quite short pieces, having been inexpertly shorn. Maybe I should just give it a go and see what happens. Thanks! I'd have thought something made from unprocessed wool would be unlikely to shrink if you hand washed it...I think it's definitely worth spinning some up and seeing what happens- perhaps knit/crochet a little square of fabric to see what washing does to it. I look forward to seeing how your spinning experiment turns out!